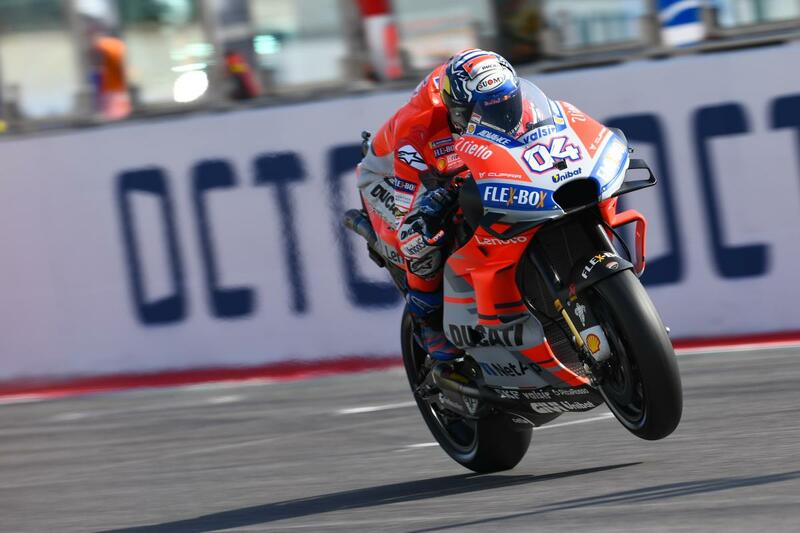 Andrea Dovizioso (Ducati Factory) took a third consecutive win for the Italian team this season, and also his third race victory in 2018, after running away at the front from lap 6, and gave the home fans many reasons to be happy at the San Marino GP in Misano. It was a straightforward race for Dovizioso, even if his teammate Jorge Lorenzo managed to hold on to the lead starting from pole position. Lorenzo fended off the attacks from Jack Miller (Pramac Ducati) and Marc Marquez (Repsol Honda) in the first corners, but Dovizioso felt today was his day to win, and after a few moments studying his opponents, he managed to pass by them and assume second position. By lap six Dovizioso made the winning move over Lorenzo, at turn 8, and from that moment on he never let go of the lead. The Ducati duo got separated by less than a second until lap 9, when Dovizioso registered the best lap of the race, and five laps later he had more than two seconds advantage over Jorge Lorenzo, who, by that time, had to battle with championship leader Marc Marquez. With Dovizioso out in front and unbeatable, Lorenzo and Marquez fought in an enthralling race right to the moment when Lorenzo couldn’t handle the pressure and crashed from second place, leaving Marquez in a lonely second and at the same time promoting Cal Crutchlow (LCR Honda) to the last step of the podium. “In the end, we finished the race in 19th, which is not the position we aim for but it was a lot better than Qualifying. I still need to improve a lot and we also need to work harder for the next race. We decide to choose a rear soft tyre because I don’t have a lot of experience and we had a good pace with it, so we opted for that different tyre on the rear. In the first 10 laps I felt really good, not very far from the others but then I had a huge drop on the left side and therefore I was losing speed on the exit of the corners and had a lot of spinning. The feeling of the bike was very good, but this issue made it difficult for me to stop the bike and in addition the hot conditions today. Anyway, I gained more experience this weekend, some things to forget and some to take away. I try to learn from my mistakes and try to work hard for the next round”. With these result in San Marino GP, Marc Marquez maintains his big advantage on the championship. The Spanish rider has a total of 221 points, now followed by Andrea Dovizioso with 154 who passed Valentino Rossi with 151 points. 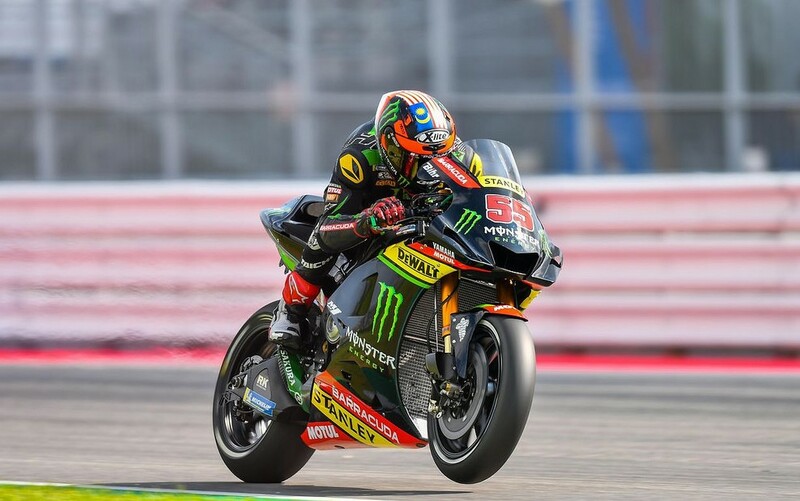 Hafizh Syahrin lost the title of “Rookie of the Year” to Franco Morbidelli, with the Malaysian rider dropping to 17th in the standings, two points behind Morbidelli. In Moto2, Francesco Bagnaia showed he is in great shape and won without any problems whatsoever. 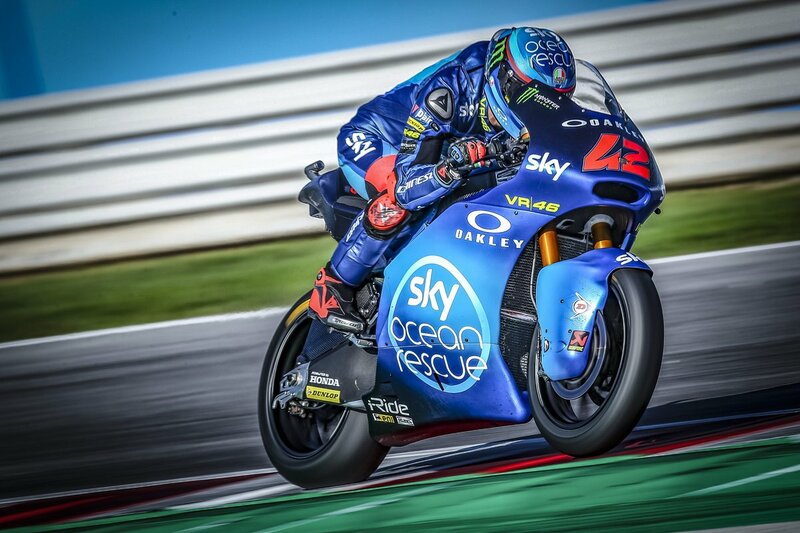 The Sky VR46 Team rider started from pole, and when the lights went out, Bagnaia managed to hold on to the lead, and from then on he immediately started to gain space to his pursuers, especially to Portuguese rider Miguel Oliveira (KTM Ajo), who started from the third row, but was fast right from the line and soon was fighting for the second position with Mattia Pasini (Italtrans) and with Marce Schrotter (Dynavolt IntactGP) in fourth. Bagnaia was in control all the time, and lap after lap the Italian made sure his opponents didn’t see the chance to pass him and maintained a rhythm that allowed him to cross the line with more than 3 seconds advantage, taking yet another race win this season and getting more points for the title fight with Miguel Oliveira. Miguel Oliveira on the other hand, didn’t have an easy race. He first had to pass by Schrotter in the early stages, and then had to face the home rider Pasini, who is known to be a hard rider to beat. But Pasini couldn’t hold Oliveira away, and the KTM rider showed he’s in a good moment, and seeing title rival running away with the victory, he passed Pasini and took with him Schrotter until the final corners. The German rider saw the opportunity to reach second spot in the final corners, but made his move on a tight right hander, and Miguel Oliveira was able to avoid the attack and get better acceleration from the corner and cross the line in second, ahead of Schrotter. In the title race of the Moto2 championship, Francesco Bagnaia stretched his lead to eight points over Miguel Oliveira, with Brad Binder moving up to third but far away from the other two riders. 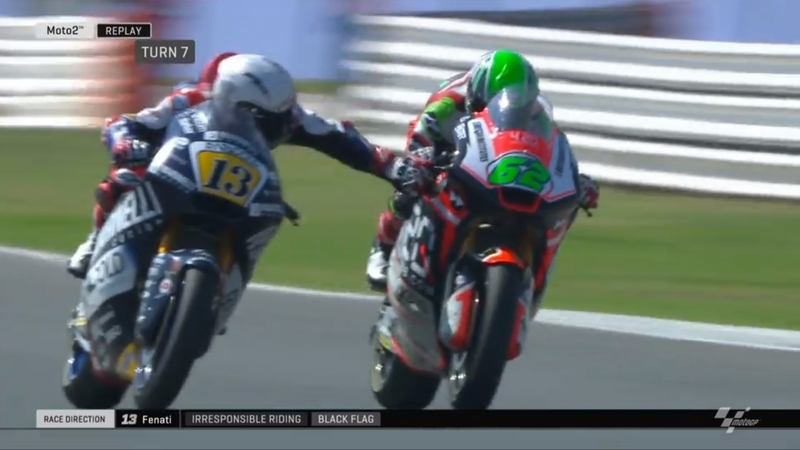 In the Moto2 race it’s also worth mentioning what happened between Stefano Manzi (Forward Racing) and Romano Fenati (Marinelli Rivacold Snipers). The two riders had a more heated moment with Manzi trying to overcome Fenati and touching his rival, and both went off track but returned moments later. But Fenati didn’t took that easily, and on the next lap he got side by side with Manzi, and with can only be described as a lunatic decision, pinched Manzi’s bike front brake lever on purpose! Manzi didn’t crash then, but crashed a few moments later, and Race Direction had no choice but to show a black flag to Fenati, disqualifying him. After the race, Race Direction decided to give Romano Fenati a two-race ban for what he did, and his team accepted the penalty. MotoGP riders condemned Fenati’s action, and Cal Crutchlow even said he shouldn’t be allowed to race anymore, and in face of his actions, there’s also rumours that his ride for next season with MV Agusta might be in jeopardy. 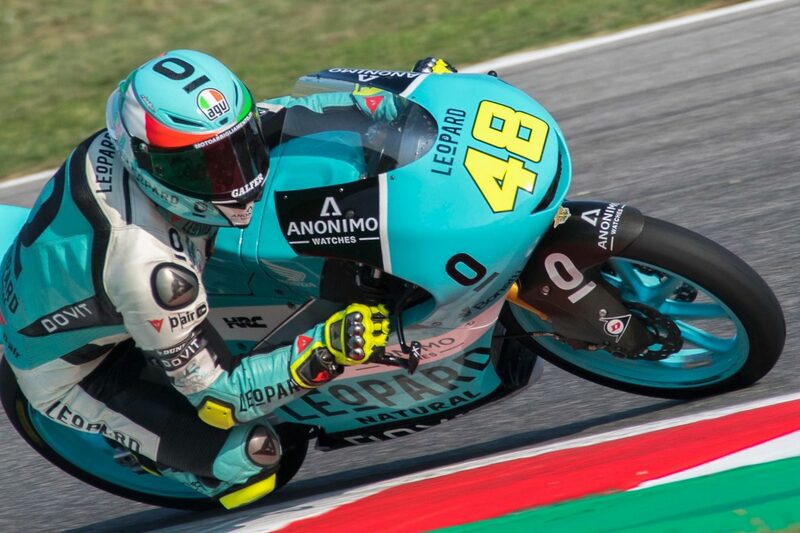 In a drama filled Moto3 race at the San Marino GP, Lorenzo Dalla Porta (Leopard Racing) secured a phenomenal debut Grand Prix victory, beating the two Del Conca Gresini Moto3 machines of second place Jorge Martin and third place Fabio Di Giannantonio on the run to the line – as Marco Bezzecchi (Redox PrustelGP) surrendered his Championship lead after a Turn 15 crash on the penultimate lap. Jorge Martin is now the new leader with 166 points, while Marco Bezzecchi moves down to second.